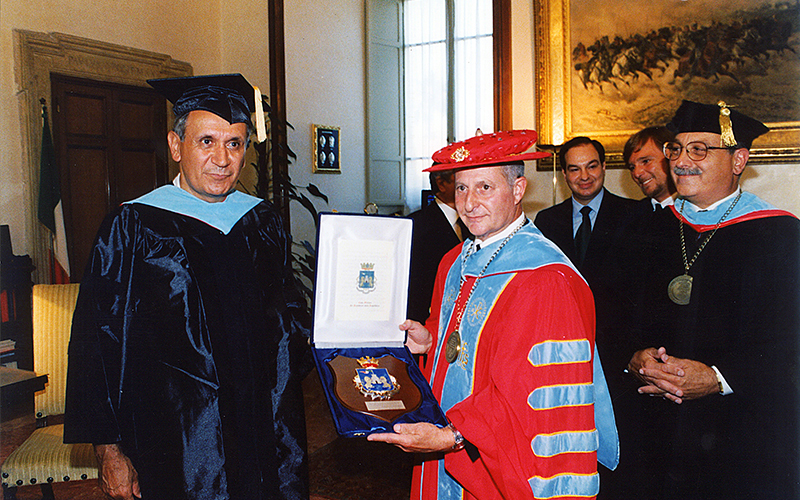 Admiral Sergio Braghi, Military Counselor to the President of the Italian Republic Carlo Azeglio Ciampi, showing the academic honor received from Prof. Roberto Calicchia, The Magnificent Rector of the Constantinian University. 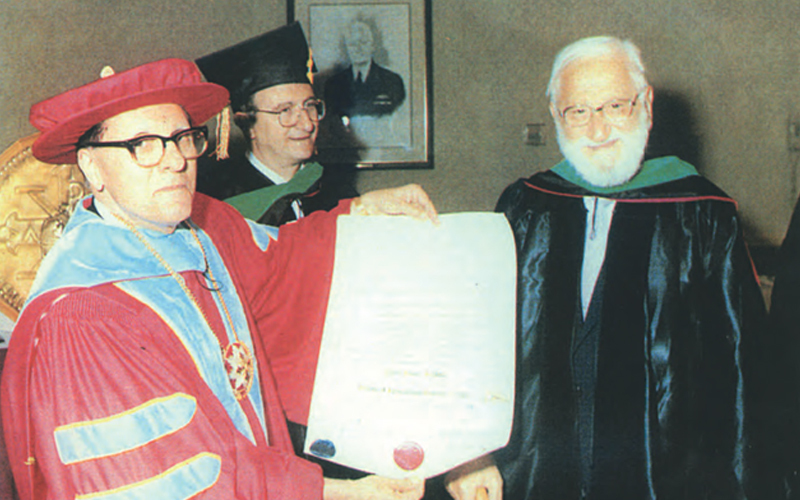 Prof. Albert B. Sabin, Nobel prize for Medicine, receiving the Laurea Honoris Causa in Immunology from the Rector of the Constantinian University, His Excellency Prof. Dott. Domenic A.Vavala, F.R.S.H. In the middle of the picture Prof. Giulio Tarro. 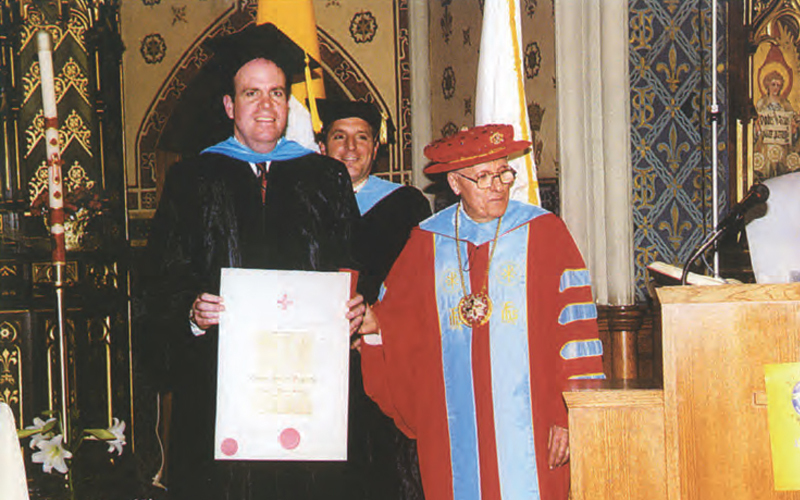 On.Charles J.Fogarty, Rhode Island State Vice Governor, receiving the academic honor from the Constantinian University Rector, Prof. Domenic A. Vavala. 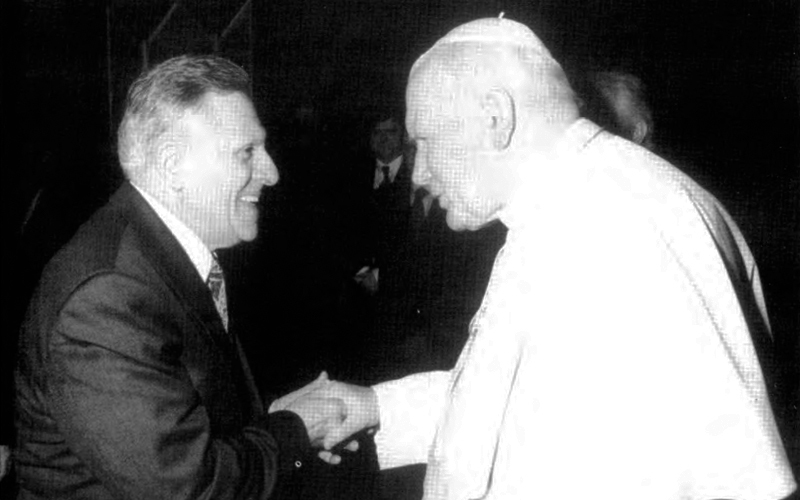 His Excellency Prof. Dr. Domenic A. Vavala, F.R.S.H., The Magnificent Rector and President of The Constantinian University is received in private audience on March 24, 1997, by His Holiness Pope John Paul II. His Execellency Rev. Mons. 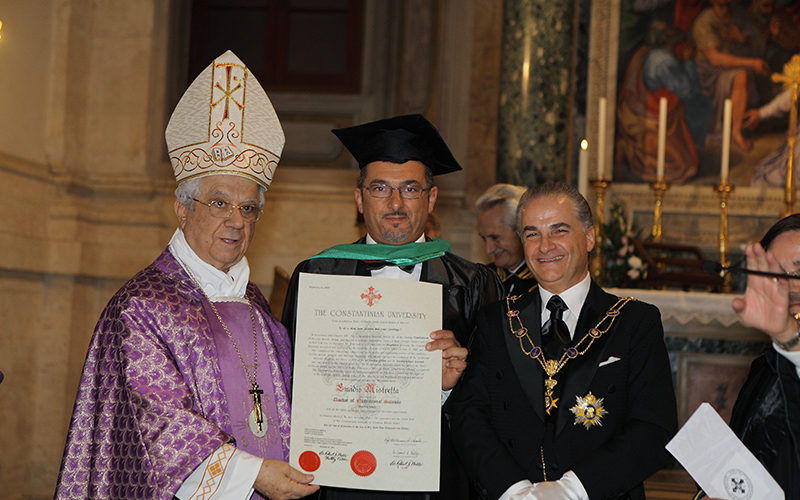 Edmond Y. Farhat, Archibishop Holder of Biblo Nunzio Apostolico,during one of the Laurea Honoris Causa ceremonies. 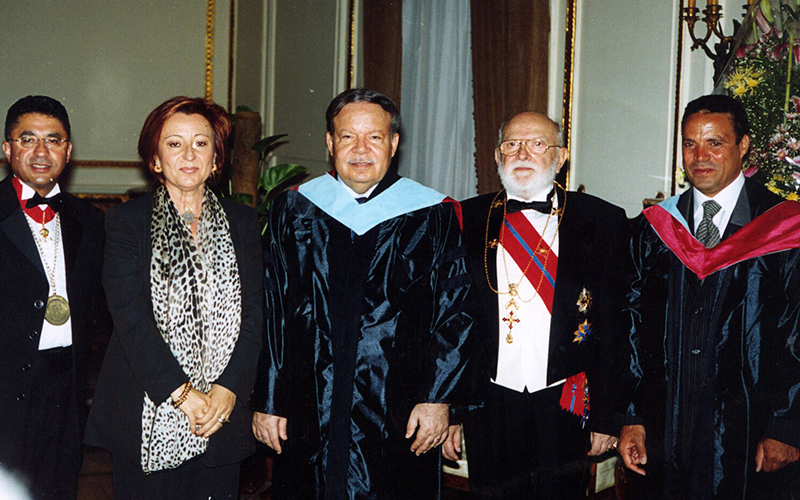 Professor Ahmed Fathi Sorour receiving the Honoris Causa Academic Recognition in Political Science from H.R.H. Prince Francesco Amoroso D'Aragona, High Patron of The Constantinian University. According to universally accepted tradition, Emperor Constantine the Great - the first Christian emperor of Rome - established a school on the Palatine Hill in Rome prior to 330 A.D. The school attracted outstanding teachers and enjoyed an enviable reputation. In 330 A.D. Emperor Constantine the Great moved the capital of the Roman Empire from Rome to Byzantium, renaming it Constantinople, the City of Constantine. Some centuries later the Palatine Hill school emerged as The Constantinian University of Masters, i.e., a guild of teachers. After the passage of additional centuries, The Constantinian University of Masters was annexed as The Constantinian University to the Constantinian-Amorian Order of the Golden Knights of Orient. The Constantinian-Amorian Order of the Golden Knights of Orient and its annexed Constantinian University are dynastic institutions, which are an integral part of the historic-heraldic patrimony - inalienable and indefeasible - of the ancient Sovereign House of the Most Serene Imperial Princes Amoroso Comneno Angelo Flavio Lascaris Paleologo d'Aragona, legitimate descendants, in direct masculine line, of the August Roman Emperors of Orient of the Dynasty of Amorium, a city in ancient Phrygia of Asia Minor: Michael II Balbus of Amorium, called The Amorian (December 25, 820 - October 1, 829), Theophilus (October 1, 829 - January 20, 842), Michael III (January 20, 842 - September 23, 867), all of whom were heirs of Emperor Constantine the Great. Today, The Constantinian University is, essentially, an honorary institution, that is, it is a select consortium of scholars, scientists, persons of letters, renowned artists and professionals from every field of knowledge throughout the world, who share the authentic desire to pursue truth (veritas), beauty (pulchritude), and good (bonum) in order to dispel ignorance, to uplift the human spirit, and to ameliorate the condition of humankind everywhere.